My husband Michael’s paternal grandmother Lucy (aka Luchenia, Lukeria) Demosky passed away fifty-six years ago today. She suffered a stroke at home (she lived with her daughter Mable and her family in Edmonton, Alberta) and died in hospital on 1 May 1960. A few days ago, Michael received his grandmother’s obituary as a PDF in an email. The scanned image (above) isn’t very clear, so I’ve transcribed it. I’ve kept the original spelling, punctuation and capitalization, as well as the original lineation. 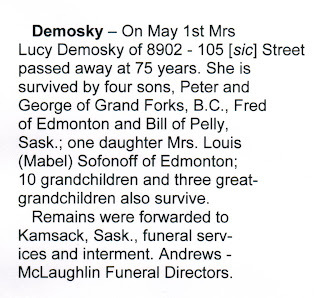 Lucy was interred in Tolstoy Cemetery near Veregin, Saskatchewan. Her husband Wasyl, who died in 1933, also rests there. 1. Mona Bacon, Librarian, EPL (Stanley Al. 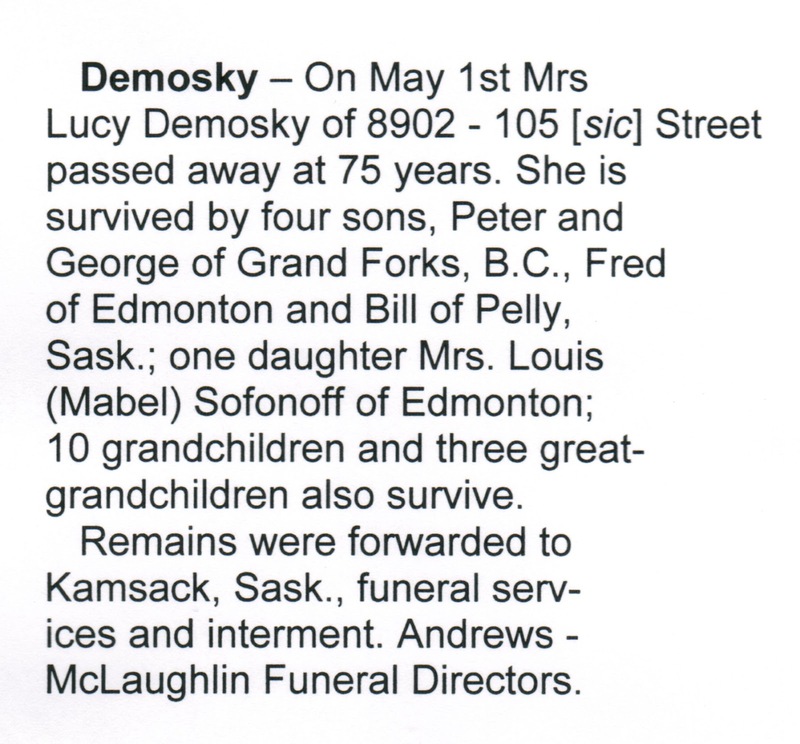 Milner Library), Edmonton, Alberta to Michael Demoskoff, email, 13 April 2016, “Demosky Obituary”; privately held by Michael Demoskoff, Hope, British Columbia, 2016. 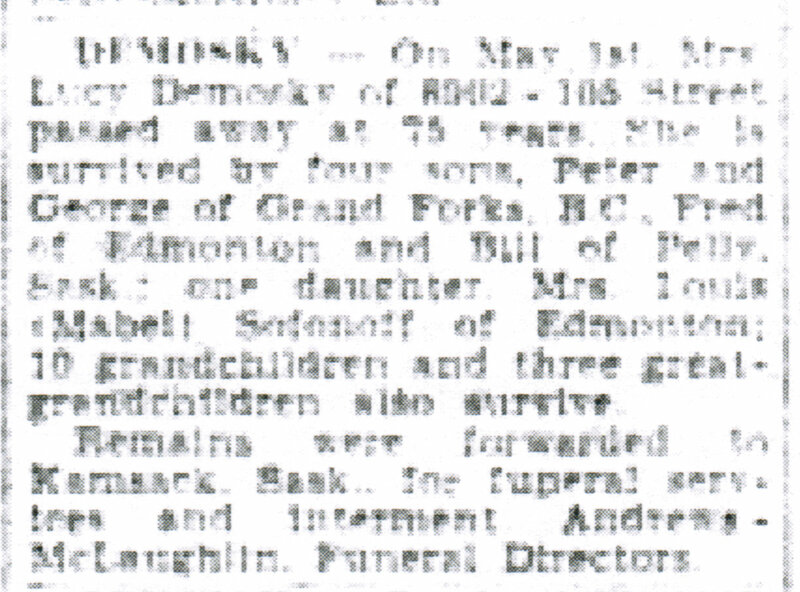 Mona attached a PDF of Lucy Demosky’s obituary from the Edmonton Journal of May 3, 1960 in her email to Michael. 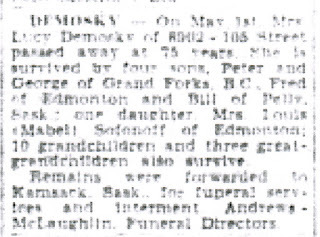 The scanned image does not show the newspaper’s edition date or the page number on which the obituary appears.